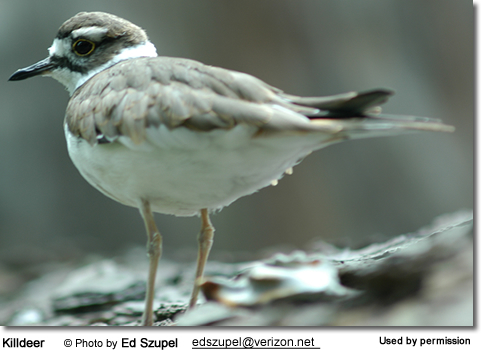 The Killdeers (Charadrius vociferus) - also known as Killdeer Plovers - are medium-sized plovers with a range that spreads across the Western Hemisphere. They are well known for their loud, wailing kill-deeeeer cries - the origin of their common name. Many earlier names also referred to their noisy calls, specifically they were previously known as Chattering Plovers or Noisy Plover. These small birds are similar in size to the well-known American Robin, but have longer legs and wings. Even though, these birds are commonly found far from any bodies of waters, they are proficient swimmers, and their chicks are able to swim across small streams. These birds are well known for their famed "crippled bird" or "broken-wing" acts, during which they pretend to be injured and an easy prey effectively luring any predators away from their nests. Once the intruder has been lead away from the nest or their young, the Killdeers suddenly "heal" and fly away. Their lifespan in the wild is about 11 - 12 years (maximum). Killdeers can be found over much of North American and parts of South America; specifically their range stretches from the Gulf of Alaska coastline east through Canada to Newfoundland south throughout the United States, where they reach both the Atlantic and Pacific coasts, through Mexico, Central America, the Caribbean and into South America, where they occur along the Andes Mountain Range until the southern border of Peru. 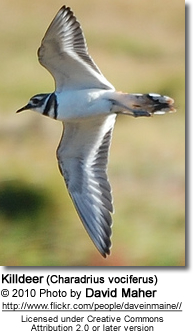 Both migratory and non-migratory populations exist. Those breeding in Canada and northern United States may travel south to overwinter in the southern U.S., Mexico, Central America, and as far south as northern South America. This seasonal movement usually occurs when the temperatures drop below 50 degrees Fahrenheit (10 degrees Celsius). Vagrants have been reported in Western Europe - these are usually young birds exploring new areas. Southern populations are either semi-permanent or sedentary. They are usually seen alone or in breeding pairs; however, in winter, they may be found in loose flocks. Their loud, piecing calls are easily heard. They are often found on sandbars, wetlands, mudflats and open habitats with some short grass, such as grasslands, pastures, meadows and short-grass prairies. They are also effectively settling into human-altered environments, including parks, golf courses, lawns, plowed fields and other agricultural zones. 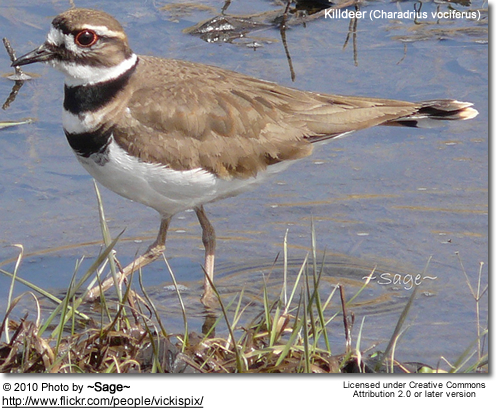 Even though Killdeer are technically considered shorebirds, they don't always live near water. These birds are widespread and common in their range. According to the National Geographic Society, Field Guide to the Birds of North America, the three subspecies can be identified by different plumage colorations and pattern of rufous edgings on their back and wing coverts (feathers). Range: Breed in Canada, USA and Mexico. Winter south to northwestern South America. Range: Western South America: Peru and northwestern Chile. 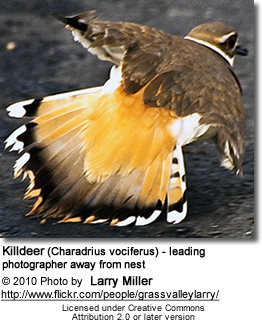 Adult killdeer reach a length ranging between 8 - 11 inches (20 - 28 cm) - including the tail; and a wingspan measuring 17.5 - 18.9 inches (44.45 - 48 cm). They weigh between 2.6 - 4.5 oz (75 - 128 g) - the average being 3.10 oz or 88 g.
The upper plumage - including the back, wings, face and cap - is mostly brown. The rump is reddish-orange and is most visible during flight and behavioral displays. The plumage below is overall white, with two distinctive and characteristic dark bands across the chest and a black band between their eyes. They have orange-red eyerings; sharp, black bills, long legs and long tails. Males and females look alike, except for additional brown markings on the faces of breeding females. 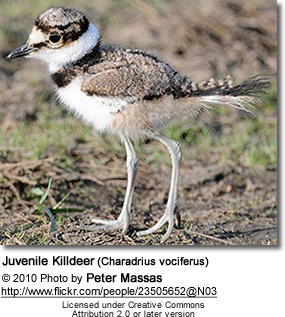 Immature birds (including chicks) resemble the adults, except for the buffed fringes and the occasional presence of tail-down. 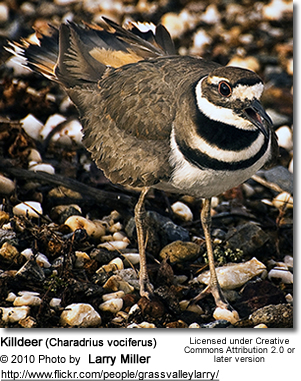 Killdeer mostly feed on insects, such as beetles, grasshoppers and caterpillars; insect larvae; as well as spiders, earthworms, centipedes, snails, crayfish, weed seeds and berries. They have also been observed hunting frogs and eating small, dead fish. Most foraging is done in mudflats, along shores and in agricultural fields. They may follow farmers as they plow their land to retrieve any unearthed worms or larvae. They breed across most of Canada, the United States and Mexico. Some populations also breed in the Caribbean, Costa Rica and Peru. They usually nest in open fields or lawns. Depending on the location, they may start breeding as early as March in southern United States or as late as June in Central Canada. Resident populations occurring in the southern parts of their range (including Mexico and the Caribbean) may nest year-round. In most temperate localities, killdeers may lay up to three broods per season, but most often only raise one brood successfully. However, in the southern part of their range, successful hatching of two broods may be common. 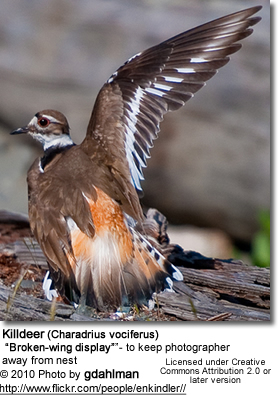 In the northern part of their range, killdeers breed once per year, raising one to two broods per season. 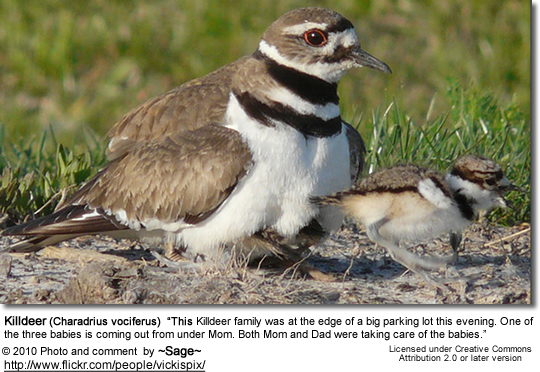 Killdeers are generally monogamous. Even though they may not necessarily mate for life, mated pairs form close bonds and remain together for the entire year (even when not breeding), or for several years. Pairings usually start to form on the breeding grounds in the spring. Males will claim a nesting territory and then seek to a attract females with aerial displays and a series of two-noted calls for hours at a time. Males also scrape at the ground and fly over their territories. Once suitable mates have been found, the pair will start scraping out the nesting site together. One of their well-known rituals is known as a scrape ceremony. The male lowers his chest to the ground and scrapes a shallow depression with his feet. The female lowers her head and approaches the male and then takes his place. The male stands with his body slightly tilted forward, his tail raised and spread, calling rapidly to the female. The actual act of mating usually follows shortly afterwards. 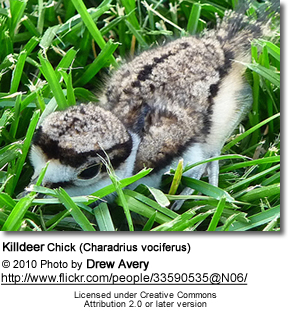 Killdeers usually nest in open areas with sparse vegetation. The nest typically is nothing more than a shallow depression or bowl that measures about 3 - 3.5 inches (7.6 - 9 cm) across and is placed on a slight rise on gravel bordered by some stones and grass. The nests are designed to blend into their surroundings. Some have also become accustomed to living and nesting in suburban areas, including on road shoulders, parking lots and flat graveled rooftops. Rooftops, however, pose considerable risks and challenges for the chicks as they are still unable to fly and have to jump off any roofs to their feeding areas. The parents usually lure the chicks down, but these jumps often lead to injuries or even death. However, one set of chicks is said to have survived a leap from a seven-story building. These birds may make several scrapes not far away from each other before choosing one to lay in. The purpose of this may be to confuse predators. The nests are usually unlined, except for a few stones, sticks, bits of shell of trash that may be added before or after egg-laying has commenced. These stones tend to be similar in color to the eggs, as are any other items the birds added and their purpose appears to be to camouflage the eggs. They have been recorded picking up pebbles and tossing them over their shoulder into the nest. In one instance in Oklahoma, more than 1,500 pebbles had accumulated this way. The average clutch consists of 4 eggs; however as few as 2 or as many as 6 may be laid. The parents take turns incubating the eggs for about 22 - 28 days to hatching. 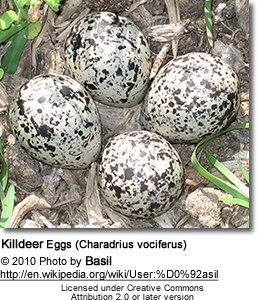 The buff-colored eggs are covered with blackish-brown spots, looking very much like pebbles, and they measure about 1.5 inches (3.8 cm) in length and 1.1 inches (2.7 cm) in width (about twice the size of a Robin's egg). The hatchlings are covered with a full coat of feathers, which are mostly buffy in color, except for a single black band across the chest. They are precocial - meaning they are able to see, walk and feed soon after hatching. After the last chick hatched and their down has dried, the parents will lead the young to suitable feeding areas. The young will remain with their parents until they are able to fly - for about 20 - 31 days after hatching, during which time the parents will protect them from predators. They are well known for their "broken-wing act" to distract predators away from their nests or young. This entails them walk away from their nests / young holding their wing in a position that simulates an injury and then flapping around on the ground emitting distress calls. Predators will follow them believing they are an easy meal. 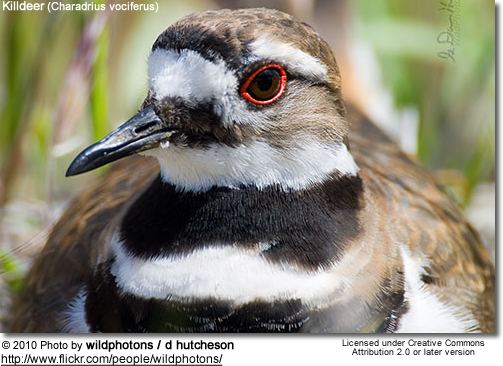 Killdeer communicate using various vocalizations and physical displays. Their most common calls are far-carrying, excited and piercing "kill-dee(r)" sounds (for which they were named), used as an alert system, in flight or by males when displaying to females. Other calls include nasal alarm calls k'dee ... k'dee ... k'dee-dee-dee, or a repeated deet-deet-deet-deet. When in distress or disputes, they make sharp dee sounds that may intensify into a long stuttering trill. This trill is also used in courtship displays. Basque: Corriol cua-roig ... Catalan: Corriol cua-roig ... Chinese: ??? ... Czech: kulík rezavoocasý, Kulík zrzoocasý ... Dutch: Kildeerplevier, Killdeer plevier, Killdeerplevier ... Danish: Kildire ... Estonian: kilatüll ... Faroese: Tvíringd svarthálsa ... Finnish: Amerikantylli ... French: Gravelot kildir, Pluvier kildir ... German: Keilschwanzregenpfeifer, Keilschwanz-Regenpfeifer, Schreiregenpfeifer ... Guadeloupean Creole French: Double collier ... Hungarian: Ékfarkú lile ... Icelandic: Skræklóa ... Italian: Corriere americano, Corriere vocifero, Killdeer ... Irish: Feadóg Ghlórach ... Japanese: futaobichidori ... Lithuanian: Balsingasis kirlikas ... Norwegian: Tobeltelo ... Ojibwa: ?????? ... Polish: sieweczka krzykliwa ... Portuguese: Borrelho-de-dupla-coleira ... Romansh: Gravarel chanerus ... Russian: ???? ???????????? ?, ????????? ???? ... Slovak: kulík kriklavý, Kulík krikl'avý, kulík krik?avý ... Slovenian: kildir ... Spanish: Chorlitejo Culirrojo, Chorlitejo de Dos Collares, Chorlitejo tildío, Chorlito gritón, Chorlito Sabanero, Chorlito Tildio, Chorlito Tildío, Chorlo gritón, Chorlo Tildío, Chortilejo Gritón, Fraile, Playero dos collares, Playero Sabanero, Ti-íto, Títere Sabanero ... Swedish: Skrikstrandpipare ... Turkish: çay?r c?l?b?t? In the United States, all native migratory birds are protected under federal law (Migratory Bird Treaty Act). This law prohibiting any disturbance of a migratory bird's nest and there are fines and penalties for doing so. A nest should only be moved if absolutely necessary and only if the only other option is the destruction of the nest. This should never be done without prior consultation and approval by a local wildlife authority. It is illegal for anyone to possess a protected bird, its nest, any eggs or even any feathers, unless they have the required federal and state licenses. Penalties for violating this law include fines of up to $500 and/or up to 6 months in jail for each offense.